Acorn squash are still really cheap and after the success of the roasted acorn squash with green tomato and jalapeno jam I just had to try roasting some more of them. This time I wanted to try a sweet filling rather than a savoury one and since I already had maple in my meal, continuing the theme with a maple filling sounded perfect. This recipe is deceptively simple for how good the end results are. I filled the acorn squash halves with some maple syrup and a touch of butter and then I let the slow roasting in the oven do the rest of the work. The maple flavour went so well with the sweet roasted acorn squash and if you are a fan of maple syrup like me then these will disappear quickly! I served the maple roasted acorn squash with the bacon wrapped maple roast pork and they went really well together. Though I served them sliced with the meal the first night, I scooped all of the remaining squash and maple filling from the leftovers and turned them into maple mashed acorn squash. The maple mashed squash leftovers were even better the next day! Place the acorn squash halves in a baking pan with the cut sides up. 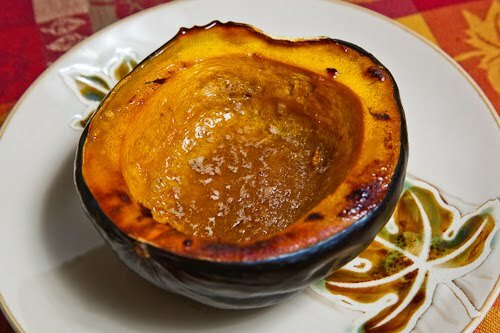 Place 1 tablespoon of maple syrup and 1/2 tablespoon butter into each acorn squash half. Cover with aluminum foil and roast in a reheated 400F/200C oven for 30 minutes. Remove the foil and roast until tender, about 30-45 minutes. this looks really good. I have a great acorn squash recipe but sometimes you want something different. Oh wow this sounds absolutely delicious! I have definitely made this before (http://funandfearlessinbeantown.blogspot.com/2009/10/crockpot-eggplant-sauce.html) and it was so easy and delicious! What a delicious way to eat your squashes with real mapley syrup. A wonderful way of eating acorn squash! I like to roast the acorn squash too, but never really made the sweet version of it. Sounds delightful Kevin. This is how my Dad ALWAYS made acorn squash growing up and its still my favorite! This gives me reason to get maple syrup soon! Good thing that the squashes and pumpkins are really abundant right now. Nothing beats a good roasted squash. wow, looks really delicious! I cant seem to find this type of squash here. Love squash; trying to convince my husband to try it; this recipe might do it. Making this right now for lunch! that looks amazing! thank you for the recipe! I really like the maple plate you used in this picture. The roasted squash looks delicious, as well! having visited quebec recently, i appreciate real maple syrup being utilized in any way beyond pancakes and waffles. this is a winner (and a way to use my canadian maple syrup). The only way to have acorn squash. Mmm, brings back childhood memories. I maple roasted some sweet potatoes today, so I can imagine how good this was! Another idea for roasted acorn squash is to use butter, ginger, honey and black pepper. You can make it as sweet or spicy as you like by varying how much ginger/pepper or honey you use. I do something similar, except I use brown sugar and butter. Pack the squash about 1/2-2/3 full of brown sugar then add about 2 tablespoons of butter on top. Cook for about an hour or so the sugar carmelizes the sides as it cooks down. Careful eating! I managed to do this, older members in my family had to know how i made this. They were very surprised it turned out so well. I do mine this way but, add bacon strips on top while it roasts.